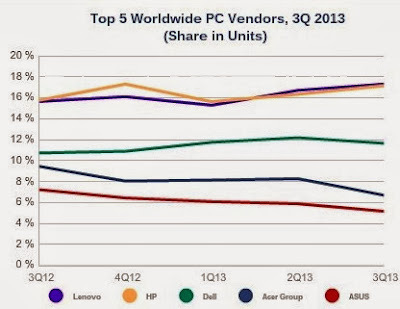 Personal computer shipments across the globe totaled 81.6 million units in the third quarter of 2013 (3Q13). Compared with last year, the market contracted -7.6% -- slightly better than the projected decline of -9.5% for the quarter, according to the latest market study by International Data Corporation (IDC). While shipments remained weak during the early part of the quarter, the market was somewhat buoyed by business purchases of PCs, as well as channel intake of Windows 8.1-based systems during September. A slight uptick in business volume contributed to shipments. The top three vendors (Lenovo, HP, and Dell) -- which all have an important presence in the enterprise and public sectors -- each saw modest positive year-on-year growth during the quarter. Conversely, consumer sentiment for PC purchases remained tepid, as evidenced by the continued struggles of vendors such as Acer and ASUS. Despite some encouraging developments in the business space, emerging markets continued to exhibit troubling signs, with Asia-Pacific (excluding Japan) in particular still facing stock of Ivy Bridge-based systems and continued encroachment from lower-priced tablets and smartphones. 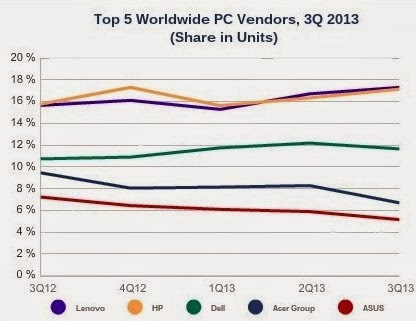 "The third quarter was pretty close to forecast, which unfortunately doesn't reflect much improvement in the PC market, or potential for near-term growth," said Loren Loverde, vice president at IDC. Whether constrained by a weak economy or being selective in their tech investments, IDC believes that buyers continue to evaluate options and delay PC replacements. Despite being a little ahead of forecast, and the work that's being done on new designs and integration of features like touch, the third quarter results suggest that there's still a high probability that we will see another decline in worldwide shipments in 2014. The U.S. market continued to show signs of recovery although shipments were down slightly (-0.2%) year over year in the quarter. Better alignment with channel partners and internal restructuring helped most of the top vendors to grow faster than the market. Additionally, emerging product categories and a greater assortment of Windows 8-based models supported the volume uptick. Migration from Windows XP to Windows 7 added a few basis points as well. HP maintained its leadership position, gaining a few points of share in the U.S. Among the other top-tier leaders, Lenovo recorded impressive growth of 25.8% year on year and managed to maintain strong positive momentum by growing its channel reach and relationship sales.